Biography of Dutch Realist Genre-Painter of Delft School. One of the leading figures of 17th century Dutch painting (1600-80), the Delft master of Dutch Realism Pieter De Hooch ploughed his own furrow. For example, while in the delicate balance of interest between persons and things portrayed in Dutch genre painting, Jan Vermeer, along with most of his fellow artists, favoured persons, his Delft compatriot, Pieter de Hooch opted for things. Of course, there is a point where their art overlaps. Both loved interiors, both searched the lighting most carefully, both made exquisite use in their compositions of the numerous quadrilaterals which these interiors presented. But by De Hooch, in his early and best work, the figure is little studied for its own sake. It became rather a valuably contrasting element in still life - a curved thing quietly varying what might otherwise be monotonous in the generally rectangular pattern. And De Hooch approaches the problem of painting interiors almost without preconceptions. He takes his colour and lighting about as he finds them, without Vermeer's dislike of swarthy shadows and preference for blue-yellow tonalities. A Vermeer, while it seems equally real, is actually more stylized. The influence of Rembrandt (1606-69), which was transient in Vermeer's painting, is lasting in De Hooch's. See also Protestant Reformation art (c.1520-1700). Even for a Dutch Old Master, De Hooch's origins were humble. He was born in 1629, the son of a butcher of Rotterdam. After his baptismal record, the next is of 1653, when, at twenty-four, he is mentioned as a "painter and footman" in the service of Justus de la Grange. That rich merchant-adventurer was evidently a kind master, for he owned no less than ten pictures by his footman, who, in occasional visits to Leiden and The Hague with his master, had the privilege of seeing good oil paintings by Gabriel Metsu (1629-67), Jan Steen (1626-79), and perhaps Nicolaes Maes. In 1654 De Hooch seems to have been free of service, for he married and moved to Delft, and in September of 1655 became a member of the guild. Within the following ten years - his thirty-sixth to forty-sixth - his finest pictures were painted, probably somewhat in emulation of Vermeer's. De Hooch prospered, and in 1664 moved to the commercial centre, Amsterdam, where he practiced very ably, but with much loss of quality in his art, the new Frenchified style. He died sometime after 1677, in his late fifties. Since his early situation as a house servant probably precluded anything like regular instruction in painting, it is of minor interest that his first master was probably the Italianate, Nicolas Berghem, landscape artist and cattle painter. 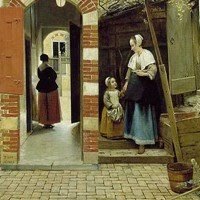 Since Berghem sought and caught very accurately the general blond tonality that prevails out of doors, De Hooch could have learned from him only the need of harmony in tone. He probably learned mostly from his observation of interiors as he served, and if we must suppose an artistic influence, it is that of Rembrandt, whether direct or mediated through such intelligent imitators as Vermeer, in the earliest phase, or Metsu. The leading motive in the best De Hooch's is a houseman's proper pride in a fine house, a very intimate feeling, which, entirely without depreciation, is to be distinguished from that householder's pride which Vermeer so eminently represented. De Hooch's favourite problem was that of suites of rooms receding in refinements of aerial perspective and intricacies of linear pattern. A very distinguished solution of such problems is the little Interior, with a standing woman and child. The way in which the doorways cut the figures and each other is exquisitely chosen, even the variation in the set of the floor tiles is important, and the chair is essential to the arrangement. In such a picture the mere space develops a kind of poetry, and in addition there is the charm of textures very delicately observed and indicated, and a quietly vivid play of light. This work would grace any list of the greatest genre paintings of the period. Of similarly delightful quality is the Dining Room, with its gracious standing figures of a woman and a little girl, and its contrasting outlets into a velvety dark closet, left, and an opaline inner room, right, through the window of which you look out of doors. There are many intimate De Hoochs of this quality, and except for the Vermeers, no Dutch interiors of a realistic sort can bear comparison with them. A typical example is the Mother by a Cradle. It is impeccable in compositional pattern of a very rich sort, in spatial relations and in sensitively studied and most various illumination. And this elaboration is modestly subordinated to intimacy of effect. Sometimes he moved out of the house to the dooryard, and painted the house from the outside. He is equally felicitous in such themes, though they have to be worked out with simpler compositional forms. London again gives us a capital example in the Courtyard of a Dutch House, in which the natural foreshortenings of the walls serve as very interesting compositional features. Of somewhat similar attractiveness, though later in date and simpler in arrangement, is the Country House, Amsterdam. Indeed, for a De Hooch, it is a little dry and obvious in composition, depending for its effect upon light falling pleasantly upon tiles and bricks, and the masterliness with which the form of the woman in middle distance is asserted in pure colour, in Vermeer fashion. The group around the table in the foreground is not quite assimilated, being too large in scale, hence dwarfing the house. Such negligences are not uncommon in De Hooch's latest years. For another Delft artist of renown, see Emanuel de Witte (1615-92), the fine architectural painter noted for his church interiors. In his last fifteen years De Hooch surrendered to the new French elegance, and though he still produced fine art paintings of a brilliant and fastidious workmanship, on the whole his work went off badly. Even technically, he no longer observes closely, but repeats his old formulas. The pictures tend to be bigger and emptier. De Hooch's decline suggests that, with all his skill, his reserves of taste and character were too small to cope with the demoralizing influence of Amsterdam. It's possible that during the nine good years at Delft, Vermeer may have been a steadying and encouraging influence, perhaps as much through personal advice as through the example of his art. In any case, the really precious residuum of De Hooch's pictures were all painted almost within hailing distance of Vermeer's house. Among later artists influenced by the compositions and tonal values of Pieter de Hooch, is the Danish genre-painter Vilhelm Hammershoi (1864-1916). Works by Pieter de Hooch can be seen in the best art museums in Europe.  For important dates, see: Timeline: History of Art.  For more about Dutch Realist painters, see: Homepage.